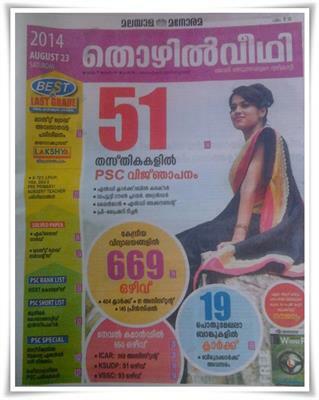 Malayala Manorama Thozhilveedhi 23rd August 2014 issue (18th August - Today) is now in stands. To read the latest issue of Malayala Manorama Thozhilveedhi dated 23 August 2014, buy a copy from your local book vendor. Thozhilveedhi from M M Group is one of the leading employment weekly which features updated news on arising opportunities in public and private sectors. Malayala Manorama Thozhilveedhi, one of the prominent employment newspaper in Kerala has published its 22nd August 2014 edition. The current issue of 'Thozhilveedhi' is packed with arising opportunities in various fields. The highlights of this issue are the vacancies in Kendriya Vidyalaya, Naval Command, ICAR, KSUSP and VSSC. Solved paper of Kerala PSC Last Grade Servant, Excise Guard held on 13th and 16th August 2014 respectively has been published in the current edition. Crash coaching for Crash coaching for Last Grade, K –TET, LP/UP, HSA, DEd & Pre Primary/Nursery Teacher are also featured in Thozhilveedi. This issue also comes with Kerala PSC Notifications of 51 posts including LD Clerk/Bill Collector, Deputy Town Planner, Attender, Lineman, LD Accountant, Pre Primary Teacher and other important posts. While going through the pages, vacancies 669 vacancies in Kendriya Vidyalaya including 404 Clerk, 81 Assistants, 145 Principal, 550 in Naval Command, 268 Assistant in ICAR, 91 opening in KSUSP, 93 in VSSC and IBPS Clerical posts in 19 banks are given with prominence. Special coaching for upcoming Last Grade, K –TET, LP/UP, HSA, DEd & Pre Primary/Nursery Teacher will help the candidates to prepare well before the exam. This issue contain PSC Rank List of HSST Commerce, PSC Junior Cooperative Inspector short list and Kerala PSC October exam calendar. Like the previous issues, 'Thozhilveedhi' has given preference to GK in the newspaper and also in the free booklet 'Competitive Winner'. As General Knowledge is given prominence in exams and especially conducted by the Kerala PSC, the booklet will guide the candidates to score high marks. Being one of the most read employment newspaper, 'Thozhilveedhi' has become the companion of youngsters to enlighten themselves and also to building up a proper career. Established as an effectual platform for job vacancies for making a ground work for their career groundwork, this newspaper is widely read by millions. If you are a job seeker, grab the 22nd August 2014 issue of 'Thozhilveedhi' from your nearest book vendor and live your dream. This is very use for the people who are in search for a job. Thanks for providing the information.